Our Southampton veterinary team knows how much your pet means to you – especially since they are all pet owners. Their knowledge and experience ensures that at every stage of your pet’s treatment, they are always in good hands. If you wish to see a specific member of the veterinary team, please use the calendar icon to check their availability. 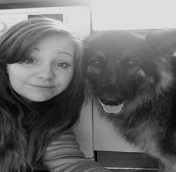 Gemma has always had a passion for animal care, leaving school to start at Sparsholt to do animal management, then continuing to work with animals in practice and start her apprenticeship in vet nursing. She qualified in 2015 and enjoys critical care and emergency work. Gemma has two cavaliers, Phoebe and Amber. She competes with them in kennel club and UK Agility shows and loves training and handling dogs. She has recently hand reared two kittens, Charlie and Lola, who’s mum was too ill to care for them. She also has two Guinea pigs and a cockatiel who keep her busy! Christos grew up with his family in Athens, Greece. Going to school and University in sunny Greece. It was here that he undertook an internship in Surgery and Emergency Care and where he also met his Wife! In 2007 he started a twelve-month spell in the Greek Navy, he then returned to the UK to complete a one-year internship at Fitzpatrick Referrals in 2008. 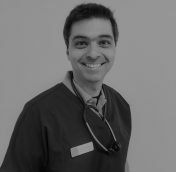 This was followed by a Research Scholarship at Fitzpatrick Referrals, it was then that Christos with a friend, founded a Referral Centre in Greece, specialising in Orthopaedics and Diagnostic Imaging. 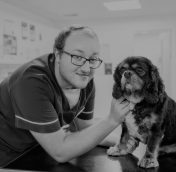 In 2016 he returned to Fitzpatrick Referrals as Clinic Practice Co-ordinator. This year Christos obtained his certificate in General Small Animal surgery, from the Royal College of Veterinary Surgeons. In his spare time, Christos enjoys spending his time with his children and studying History. 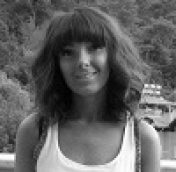 Molly qualified from the University of Glasgow in 2014. She is originally from upstate New York, and has two previous degrees from the USA, including veterinary nursing and Animal Science. 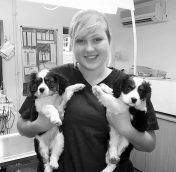 Since qualifyig as a vet, Molly has worked in a large and a busy small animal hospital in Coventry, Warwickshire. She has relocated to further advance her experience, and to seek a bit more sunshine! Her professional interests vary widely, but she is really interested in feline medicine, and emergency critical care. Outside of work, Molly likes to spend a fair amount of time catering to the whims of her two feline owners, Coco and Darwin. When they can get out of the house, her and her staffy, Ceilidh, enjoy walks in the countryside. She also enjoys swimming, rock climbing skiing, and reading. In 2016, Sarah graduated and qualified from Anglia Ruskin University with a honours degree in Veterinary Nursing and Applied Animal Behaviour. 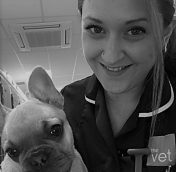 She joined The Vet in December in 2017 after working in various practice’s around Dorset and Hampshire. She didn’t know what she wanted to do growing up but knew she always wanted a job where she could work with animals and feel like she was making a difference, even on a small scale. She particularly loves medical nursing, nutrition and behaviour and has three cats called Missy, Harley and Tyke who keeps her very busy. In her spare time loves to read, explore the countryside with her camera and bake. 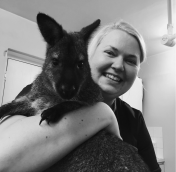 Laura started working as a veterinary nursing assistant in 2002, qualifying as an Animal Nursing Assistant from Sparsholt college in 2003 and as a Registered Veterinary Nurse from Myerscough college in 2011. She enjoys being a clinical coach to student nurses, wound management and has a passion for exotic pets. She hopes to further her career by doing an advanced certificate in surgical nursing. She owns two beautiful Cavalier King Charles Spaniels, Evie and Jessie who she enjoys walking in the forest and on the beaches. She also has two retired horses, Majik and Faith. Maz has always had a great interest in animals and has owned many different species since she was a young girl, ranging from horses to rats and many more. Maz has received qualifications in the First Diploma in Animal Care and the National Diploma in Animal Management. After her studies, she went on to open up her own Pet Shop called “Amazing Pets”. Maz is very eager to learn new skills and looks forward to starting her training to become a Veterinary Nurse. Claire has always had a passion for animal care. 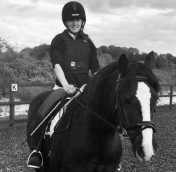 She studied Animal Management at Sparsholt College in Winchester and gained a BSC Honours Degree in Equine Studies. She has worked in a pet store and agricultural centre as an equine specialist. Claire is qualified to prescribe and supply animal medicines as an R-SQP for companion, equine and farm animals. 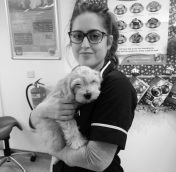 She has volunteered in several different veterinary practices in her spare time and is studying a level 2 Animal Nursing Course to become a qualified animal nursing assistant. Claire has a cat called Maizie, a horse called Crown and a Chinese Water Dragon. Lee joined The Vet in August 2016, having previously studied Animal Management and Care at Sparsholt College. Lee has always had a passion for Animal Care and hopes to continue his education, to become a Veterinary Nurse. At home he has plenty of pets, including two dogs, two cats, two horses, Two guinea pigs and a Tortoise called Louie. 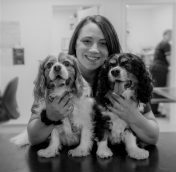 Holly joined the team at The Vet Southampton in November 2015. Working with animals has always been Holly’s dream and she loves greeting every pet when they walk through the door. 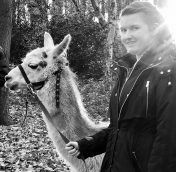 Holly currently has a Level 3 Extended Diploma in Animal Management which she achieved during her 2 years spent at Sparsholt College in Winchester. Holly has lived with animals her entire life, currently owning a Chocolate Labrador named Rolo and a tropical fish tank. Hope is interested in art, looking after animals for other people and walking along the beaches with her dog. When Hope visits her parents on the Isle of Wight, she likes to walk her dog along the beaches and cliff top. Her dog also loves running in to the sea and dislikes when they stop for a drink! Hope also has a tortoise shell cat, who had cat flu, that she rescued from a vets. The cat is still in recovery but is getting a lot better. She is now playing like a kitten, exploring the garden which she really enjoys. Julia has had a passion for animals ever since she was a little girl and she could not think of anything better than being at home with her German Shepard Roxie. 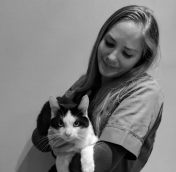 Although Julia knew she wanted to work with animals it was not until she was at college that she realised Veterinary Nursing was the career path that she wanted to pursue. 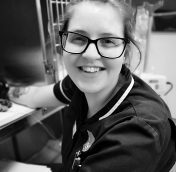 Julia is currently studying for her degree in veterinary nursing at Pershore, Warwickshire college and undertakes her work placement at The Vet Southampton. While on placement she lives locally with her family. In her spare time Julia enjoys walking her dog, socialising and being around friends. Georgia joined the team at Southampton in September 2015. She loves greeting the clients and animals, believing that a friendly welcome will let clients know that their animals are in safe and affectionate hands. Georgia believes that her time here will really help her find the right career path. Throughout Georgia’s childhood, animals have always been a huge part of her life. She has had many different kind of animals as a child, but has decided that whilst she lives with her parents, she shouldn’t bring home any more pets, so is content with the company of her cat, PussPuss. Annie joined The Vet reception team in September this year to follow her dream of working with animals. 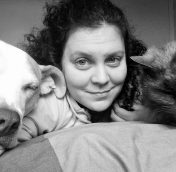 When she started volunteering with Cats Protection as a fosterer earlier this year, she knew she had to do a job that allowed her to continue to work with animals in some way. She loves getting to know all the different cats that come into Cats Protection and helping her foster cats find a loving home of their own. She also volunteers for the British Hen Welfare Trust on rehoming days, rehoming commercial laying hens so they can live out their retirement in comfort. Annie especially enjoys learning about welfare and behaviour of companion animals and tries to attend as many learning seminars and workshops that she can. When she has any free time, she enjoys travelling with her partner, drawing and painting, and visiting her 16 year old, black cat, Mimi who now lives the life of luxury at her in-laws’ house.